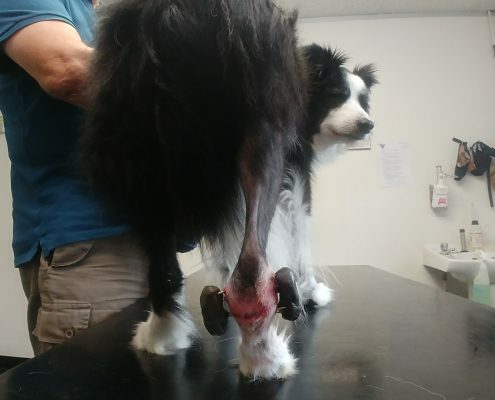 Whilst most of these articles involve only one injury or illness in a pet, poor Summer, an eight year old Border Collie, has had many to contend with. Being a Collie she loves to try and round up other dogs and, less usually for a Collie, she also loves to swim. We first saw her five years ago because she had been lethargic and vomiting intermittently for a few weeks. Addison’s disease (where the adrenal glands do not produce enough steroids) was diagnosed. Summer was stabilised on tablets but after a few years their price went up tenfold. Fortunately another company was launching an injection for Addison’s disease at the same time and we could swop her over to that. We had to spend some time establishing the correct dose and injection frequency but she has now been well controlled on the same dose, at four week intervals, for two years. Last year she became lame in the right hind leg. The pain was localised to her ankle and she seemed to completely recover with painkillers and rest. We didn’t know then that this seemingly temporary injury would come back to haunt us…. Her next problem occurred earlier this year when she ruptured a cruciate ligament in the left knee. She had an operation to alter the anatomy of the tibia which then allows normal activity despite the absence of a functioning ligament. Unfortunately a few days later she fractured the tibia below where a titanium wedge had been inserted. This was a disappointing development, to say the least, but the fracture was not displaced and we were able to overcome this by splinting the leg for eight weeks. 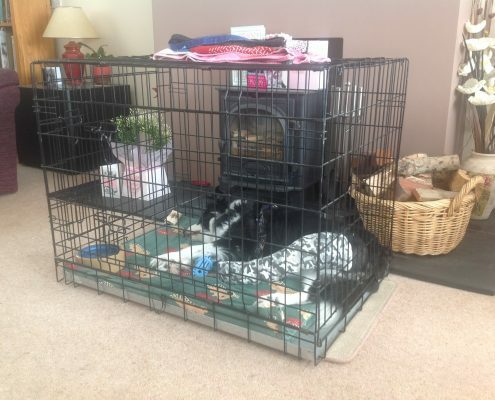 During this period she had to spend a lot of time in a cage but, fortunately, she is a huge fan of David Attenborough’s Planet Earth and Blue Planet programmes and watching these made the time pass more pleasantly! During this time, however, the right ankle broke down. Presumably the injury last year had weakened some ligaments and these had then been put under additional strain when she couldn’t use the left leg. When these ligaments ruptured this caused an unusual angulation in the ankle, causing it to drop much closer to the ground and making it difficult for Summer to bear weight on it. An X-Ray identified the specific joint level within the ankle that was affected. We carried out an operation to strip the cartilage from this joint and place a connected framework of pins above and below it. This would hold everything together whilst bone filled what had been the joint – restoring stability to the ankle. It is now three weeks since the operation and Summer is making good progress. She will have a monitoring X-Ray in another week and we hope to remove the framework a month or so after that. We hope that she will then have many trouble-free years of swimming, dog herding and – another of her peccadilloes – staring at fishing floats for hours on end!